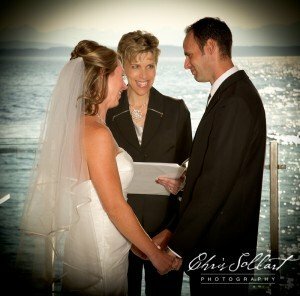 What do I remember about their waterside wedding ceremony on the sunny and warm evening of July 7th at The Edgewater Hotel in downtown Seattle? I remember hoping during their vows that Photographer Chris Sollart was capturing close-up photos of the moment. So much joy and emotion. And yes, Chris did. I remember the smiles and joy of family and friends during our ceremony. I remember standing off to the side afterwards and watching everyone interact. There is one of my favorite things to do. Most of all, I walked away truly knowing this world has been blessed by another very loving, devoted and fun-loving couple!